Brazil. Just mentioning the name of this immense South American country conjures exotic visions. Say it out loud to yourself, and soon samba-fueled carnival dancers in Rio de Janeiro invade your thoughts. An image that probably would not come to mind is agroecology — the practice of sowing ecological processes into agriculture for healthier and more sustainable food choices. In April I was invited to Rio Grande do Sul, Brazil by the Inter-American Foundation (IAF) to take part in its 10th meeting of the Ecovida Agroecology Network (Ecovida). As a result, I will now think of Brazil through a different lens: organic food systems! At Ecovida I was able to share experiences and best practices with over 70 people from all over the Americas. Participants made up of producer families, consumers and NGOs came from the IAF network plus 1,700 people from Ecovida. It was an intense seven days’ work. For almost 20 years Ecovida has been operating with farmers who organize themselves to market their agrochemical-free products and to attest to the quality and origin of these products. They follow what is known as the Participatory Guarantee Systems (PGS). These are practices that empower farmers through knowledge, community development, and the exchange of knowledge. The goal is to provide quality assurance on a range of organic-certified products. Throughout the network’s existence, Ecovida has made important achievements such as Brazil’s National Program of School Agriculture, which earmarks 30 percent of its budget to family and local agriculture. 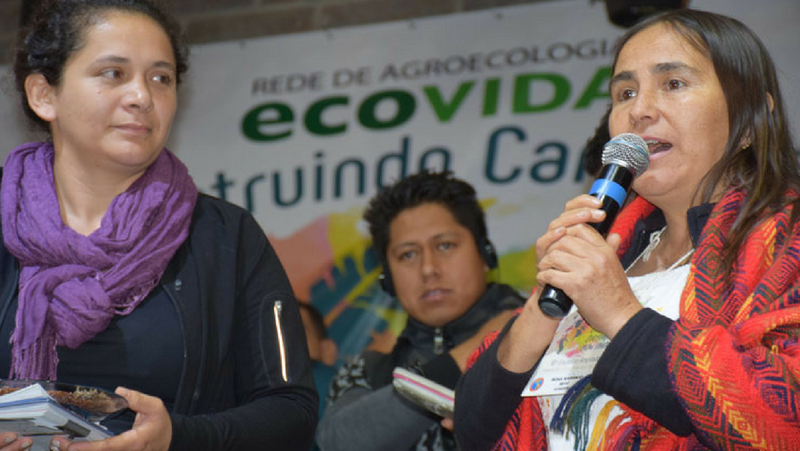 The Ecovida event covered several topics including organic agriculture, the PGS, projects to promote youth in agriculture, empowering women, marketing, educational programs for consumers and producers, working with the government and more. Meeting with partners from the IAF network allowed us to share knowledge and experiences based on our work. Participants learned about marketing tendencies to sell our products, working with young people and women from rural communities, and strengthening the promotion and development of new community leaders. By coming together, we came to realize that there are many like us working to recover values and to save the planet! Around 1,700 people took part in the Ecovida meeting. The network provided food for us all. Over 30 chefs from the slow food movement cooked more than eight tons of organic food over four days. The food proved a feast of flavors for the palate. It’s easier to understand Portuguese on a full stomach! Of all the workshops, seminars and plenary sessions, the activity that stuck with me the most was a session on the benefits of agroecology over large-scale, commercial agriculture as a business (agribusiness). The presenter explained that industrial or large-scale food production is not culture but a hegemonic model that consumes and devours everything in its way. When you go to a grocery store most of the food brands belong to five or ten big companies. On the other hand, agroecology is food sovereignty. It is life, and it is a healthy system for creative and clean food. At the same time agroecology empowers people. It gives them knowledge and diversity in crops. It allows people to feed themselves first rather than feed commercialization. They learn to eat what is available from nature and to depend on seasonal food rather than burn energy in transporting out-of-season foods. The presenter told us that growing food should be like a relationship with respect, love, care, and protection. It shouldn’t be the opposite: aggressive, abusive, intense, and void of respect. With all that I learned, I wondered how this can be applied to my own efforts in Costa Rica. I asked myself, “What are we working for? What are we looking for?” As we gain greater demographic scope through our resources — time, human, economic — little by little we can generate positive impacts on communities and society as a whole. It involves strengthening the courage that sustains agroecology, reclaiming small production, and diversifying family agriculture. It involves ancestral knowledge, the pleasure of fresh food, food made with love, food made with the best ingredients available, and food that is delicious. We have to convince government authorities to listen to their citizenry so that they encourage and subsidize agriculture for life. We must encourage small farmers to adopt agricultural measures that do not poison the soil, families and, naturally, consumers. This is a right that belongs to us all. It is our duty to value the efforts and strengthen the bonds with the people who harvest our food. We rely on farmers and agricultural workers at least three times a day — for breakfast, lunch and dinner. It is an occupation that is disappearing. Fewer and fewer young people want to become farmers like their parents and grandparents. In my hometown more than 90 percent of food, household and body care products carry the first and last names of the makers. I know them because they are part of my community. I know their histories and where they come from. They are part of our lives. With my economic power, I choose whom to support through which products I buy. And I will continue to support products and businesses that help generate new jobs, promote fair trade, care for the planet and provide access to a dignified life.